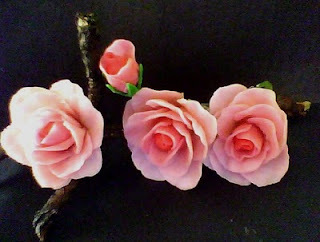 These shaded pink roses are made without cutters . Make cp dough balls, mix in red oil color in a small part of dough for the inner dark petals. Then mix in plain dough for getting lighter shades as required.This way three shades of balls will be made for the petals. Small - Make 4 petals dark shade, one for the inner bud and three for the petals around it. 1 Make the rose centre by wrapping cotton on the hooked wire. 2 Put a thin layer of cp dough around the cotton bud to cover it . Leave to dry. 3 Start by adding the inner 3 petals , curve the edges slightly. 4 Now shape all the rest of the petals by lightly cupping in the centre and curving the edges. 5 Add the rest of the petals, 5 in the next layer and 7 in the last layer. Use fevicol to make the petals stick nicely. 6 Keep the prepared rose to dry in an egg tray/ or on aluminium foil spread on a cup.It should not be hung upside down as the rose will be heavy and the petals may fall off. Since the rose will be large and heavy , it will take at least two or more days to dry completely. If any petal seems loose , stick it again with fevicol. After the rose has dried completely wrap the wire- stem in floral tape. Make the centre as described earlier. Use dark shade of CP for inner petal and lighter for outer ones.3 petals are enough for a bud, but more can be added for a half-open bud. Calyx is essential for making any flower look lifelike, it also hides the petal joints !! Mix in green oil color in a small piece of dough. Roll it out thinly. Take a knife and make zig-zag line, make 5 points. Carefully lift it and using fevicol wrap it round the lower part of the flower. BUD CALYX- The sepals have to be longer , so as to enclose the bud.